At the Underline Launch Party at SLS Lux Brickell on Thursday, October 18th, Friends of The Underline Board of Directors hosted a rocking celebration in advance of the project’s groundbreaking on November 1. Philanthropists and luminaries gathered in the hotel’s Secret Garden, a lush, covered outdoor pool and garden on the 9th floor with breathtaking views of the Brickell skyline. The evening kicked off with a live, private concert by Friends of The Underline board member Emily Estefan, followed by project status comments by Founder Meg Daly. Brian Keeley of Baptist Health South Florida spoke at the hospital networks sponsorship of The Underline’s wellness programming. 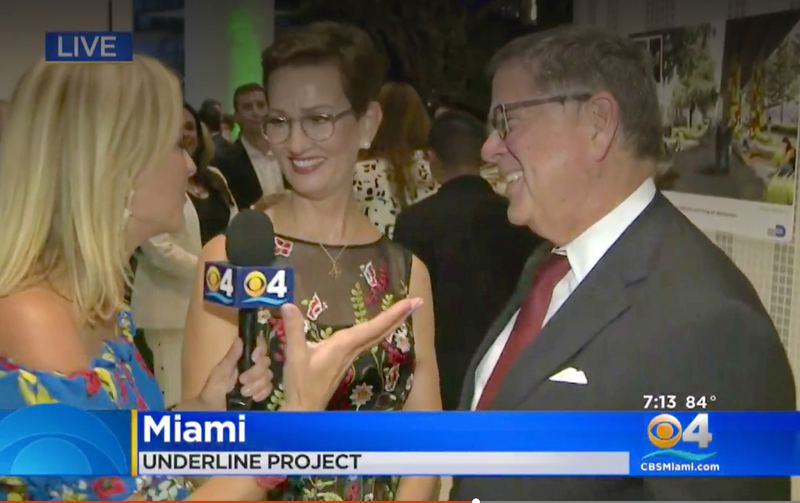 The evening culminated with the recognition of the James S. and John L. Knight Foundation’s investment in city-building initiatives like The Underline and closing remarks by Knight Foundation CEO Alberto Ibarguen.Catch CBS 4 Lisa Petrillo’ segment as she shares the excitement here.